We’d like to present our new sets of features, all with a small common denominator: they make operations on MailUp more agile and intuitive. From the Undo and Redo commands in the editor to functions that make subscriptions with pop-up forms faster and more effective, up to features for creating complex master data filters. Last week we presented new security and data protection features that work behind the scenes of the platform, and today we’re going back up to the surface to tell you about the new features that you’ll find just a click away. Segmentation of sendings through a master data filter. Although we’re sure that you’ll notice the improvements the next few times you access the platform, in today’s post we’d like to discuss them in more detail, explaining the benefits, resources and potential of the new features. Often the speed of an operation is directly related to the amount of flexibility you are allowed by the tool you work with. And the new features in the BEE editor focus precisely on flexibility: now when you create your emails, you’ll find a small panel of functions with which you can undo or redo changes to the message. The panel is both discrete and easy to use. Can you see it? In the screen below, it’s located in the lower left corner. View the history of changes made to the message. By clicking on the history icon (the leftmost one), a dropdown list will open showing you the timeline of the last changes made to the email: in practice, you can move back and forth between the changes, choosing one of the previous versions of the message. Remember when we introduced the multi-channel pop-up form this past spring? They are multi-channel pop-up subscription forms you can use to collect the email addresses and phone numbers of new contacts. Display delay: this feature lets you set a time interval (from 1 to 99 seconds) between the opening of your site’s page and the pop-up’s display. If the first feature speeds up the processes of gathering contacts, the second is a small, but equally important, marketing feature. Here’s an example: in your blog – where your objective is more to provide information than it is strictly commercial – the time interval between when the page is opened and when the pop-up opens can be strategic, giving the visitor time to get an idea of ​​the page’s usefulness before you invite him to subscribe to receive the articles in newsletters via email. This way you can add multiple values ​​separated by commas (without spaces), using up to a maximum of 500 characters. Here’s an example (in the screenshot below). The condition “is one of these” lets us insert four different values ​​related to the field City in the same filter: Milan, Rome, Naples, Catania. The filter will search within your database, locating only those recipients residing in the cities of Milan, Rome, Naples and Catania. As mentioned, you can also carry out the opposite operation, excluding the same cities by setting the condition “is not one of these”. The new feature is aimed at streamlining processes, in this case those related to configuring a profile filter. The result: one and only one filter for multiple values. Reduce the number of resources downloaded from a web browser when a page is visited. This means 60% to 80% less data is downloaded, with significantly reduced app upload times, especially with slower connections. Reduction in the number of calls to the MailUp database, in relation to the account’s “identity” data (domain, language, options, test status, etc.). Although some of these technical improvements are not very transparent, they have a very clear purpose: to improve the loading times for most pages for the full benefit of our customers, improving the platform’s performance and stability. We’ll finish off with some news concerning the SMS channel. Do you know what Alias is? It is the alphanumeric sender mode linked to SMS campaign sending: the Alias ​​lets you replace the phone number in the sender field with the name of your company. To set up the Alias, however, you must have approval from the Communications Authority (AGCOM). Starting today, operations have become easier and faster: the VAT field which had previously been validated by VIES (electronic system for the exchange of VAT data) is no longer mandatory. This lets NGOs and other organizations which are not registered with VIES request and easily create an SMS alias. The process is undoubtedly more streamlined on the platform, even if the data entered may be verified by AGCOM and, in the event of improper behavior, result in sanctions. 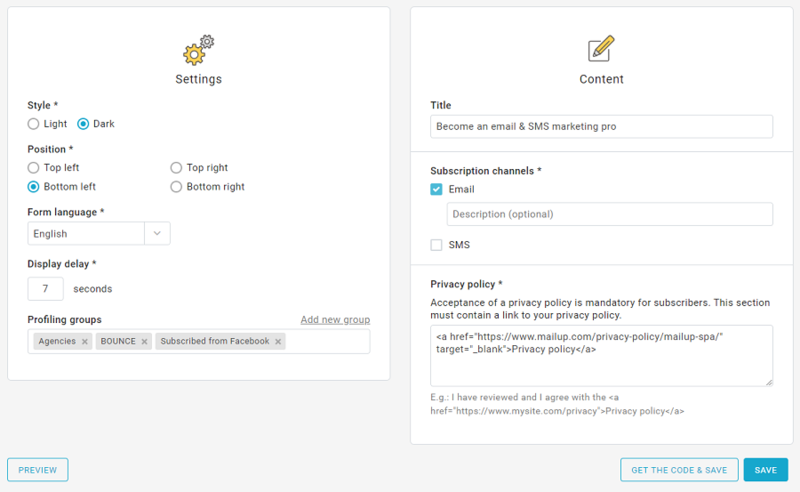 As usual, we invite you to personally play around with the new features in MailUp, in the hopes that browsing through it and all the email marketing operations will be even more fluid and intuitive. Haven’t tried MailUp’s features yet? You can start now: just fill out a form to get a free 30-day trial of the platform.